FREDERICK, MD-Saturday night's doubleheader at Nymeo Field between the Frederick Keys and the Myrtle Beach Pelicans was suspended due to rain. The two sides will pick up this seven-inning contest in the top of the sixth on Sunday at 4:30 p.m while game two follows at 6:00 p.m and will be a nine-inning game. Frederick and Myrtle Beach will then play only one game on Monday to conclude the regular season starting at 2:00 p.m. Fans with tickets to Saturday's doubleheader game may exchange their tickets for any of the Keys remaining games (Sunday-Monday) or for any April or May game during the 2019 season. All exchanges must be made at the box office. Keys players and coaches will wear Art in the Park jerseys during Sunday's 6:00 p.m game. The jersey auction will RESTART again, when gates open on Sunday at 12:30. Bidding ends after the fifth inning of Sunday's regularly scheduled game (6 p.m start time). The jersey auction will then go live in the Courtyard during game two. Fireworks follow game two Sunday. Sunday's Guns and Hoses Softball game presented by Berman, Sobin, Gross, Feldman & Darby LLP will run from 1:30-3:30 p.m. Gates open at 12:30. Additionally, the Sesame Street meet and greet picnic runs from 5-7 p.m.
At the time the Keys and Pelicans were stopped it was a 0-0 game, while starting pitchers Zac Lowther and Bryan Hudson each allowed only one hit. Lowther retired the first 14 batters he saw before Christian Donahue singled with two outs in the fifth inning. At the time Donahue singled, it ended a string of 31 hitters in a row retired by Frederick pitching (dating back to Thursday night at Potomac). 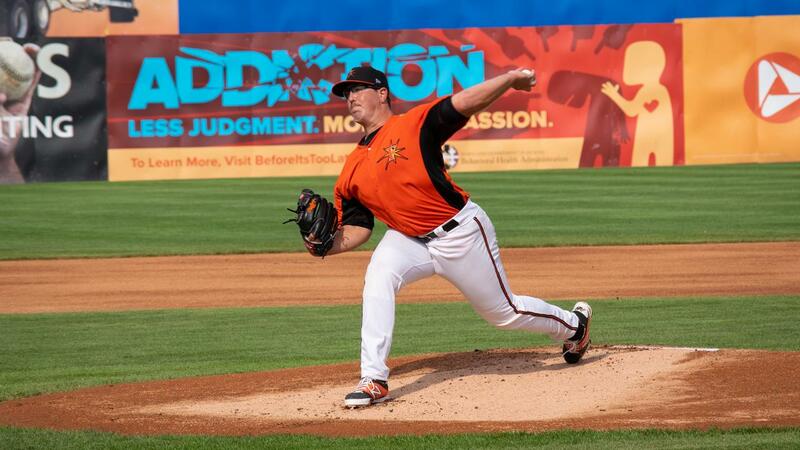 In Sunday's regularly scheduled game, right-hander Cody Sedlock (0-2, 10.50) starts for the Keys against Myrtle Beach right-hander Alex Lange (6-8, 3.73). Both games can be heard on frederickkeys.com and the TuneIn app starting at 4:15 p.m. For tickets, fans can call the Keys at 301-815-9939 or visit frederickkeys.com.